Despite introducing the public to its plans for a "wireless future" in 2016, the dawn of that era has been marked by hiccups for Apple. Just as the release of its AirPod earphones was delayed due to signal issues, another -- and possibly more severe -- glitch is effecting the release of the company's wireless AirPower charging mat. At the tech giant's annual iPhone unveiling event at its Cupertino headquarters on Wednesday, there was literally zero mention of wireless charging -- an advent the company originally hyped as integral to its plans -- let alone anything about the AirPower wireless charger it previewed an entire year ago. The iPhone Xs, Xs Plus, and XR come with a bevy of enhanced features and with modestly better battery life, but Apple provided no update on the wireless charging mat. Instead, the event was rife with praise for the new slate of iPhones and their 12 megapixel cameras and A12 bionic microchips. Also, Steve Nash was there to talk about basketball, for some reason. Perhaps the most damning evidence is illustrated on Apple's website: All mention of the Airpower charging mat was eerily wiped from the company's website after Wednesday's event. "AirPower must be well and truly fucked. No one at Apple will say a word about it, even off the record. And as a result they didn’t even mention inductive charging during the event, even though the XS and XR both charge faster than the X." AirPower was primed for a 2018 release, but as Winter nears, that prospect is looking all the more unlikely. Bloomberg reported in June that "a series of technical hurdles" was hampering the company's ability to bring the product to launch. One of those obstacles reportedly pertains to the charging mats overheating, which is certainly a worthwhile issue to delay a release, if Samsung's Galaxy Note 7 saga is any reminder. According to the report, Apple had hoped to release AirPower by September, but the product's absence from Wednesday's theatrical rundown looks kind of like a glaring omission now. 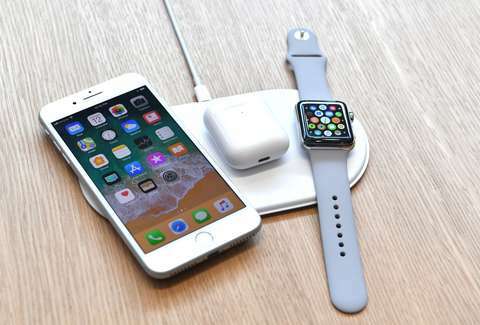 When the AirPower mat concept was initially unveiled with the iPhone X, it offered the prospect of charging multiple devices -- the iPhone, AirPods, and Apple Watch -- simultaneously. If anything, that possibility seems to be dwindling, at least for the time being.